Save Time and Money on your Website! 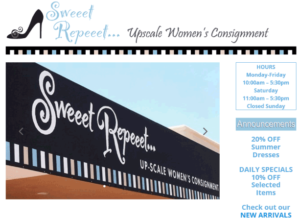 Sweeet Repeeet Consignment asked me that question, and here is their newly redesigned website. We offer a website that is user-friendly, easy to update, and doesn’t require the need to understand html code. There is no need to be a programmer or highly technical. Once your site is developed, you can make simple updates, add weekly specials, insert blog posts and more. You don’t have to wait on your developer’s availability, and you don’t have to pay for minor changes. You will save time and money. Want to promote this week’s special? Need this update NOW? WordPress offers a variety of themes to accommodate the purpose of your website whether it is strictly a blog site, totally informational, requires a gallery of photos or a portfolio, or includes eCommerce. WordPress develops the code behind the scenes, and what you end up with is a clean, responsive site that is legible on all platforms including your smartphone, tablet and your laptop. Another “must” for your site is the ability to back up the files and MORE important, the ability to recover your site quickly if it goes down.With every website Designer Mouse designs, we set up a back up and recovery system as part of the project. You will be able to manually backup your files or schedule backups to occur automatically. And recovery is as simple as the push of a button. Having a backup of your website provides the peace of mind we all need to make sure our sites are running at all times! Want to maintain your site? Designer Mouse offers “WordPress Training 101.” Once we develop your site, we will set up usernames and passwords for your staff that should have access to the files. We will go through the website to show you how to maintain it, update it, and back it up. And here’s the best part: when you make a revision to your site, you can preview it before it goes “live.” No surprises. Now I know you need to focus on your core business. That is where your time must be spent rather than figuring out how to build a website. Hire a professional for this task. Have more questions? Complete the Contact Form on this website and request a complimentary consultation for your website needs. Whether it is a redesign of an existing site or the development of something brand new, get in touch and let’s see how we can improve your online presence.